Mcity. It may be a mock city proving ground for connected and autonomous vehicles but what is taking place there, and around Ann Arbor, is making the use of these technologies real, including a new testing system for evaluating the safety of autonomous vehicles. Carrie Morton is Deputy Director of this amazing research facility and shares some of the ideas of what makes it cutting edge. You can learn more at mcity.umich.edu. 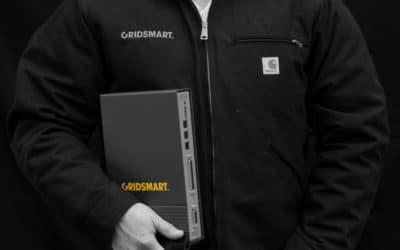 Regina: (00:08) From GRIDSMART Technologies, I’m Regina Hopper. Welcome to POLICYSMART. Regina: (00:19) So welcome to this edition of POLICYSMART where we have someone that I met probably three years ago, maybe four years ago in the lovely state of Michigan, Carrie Morton with Mcity. It is truly one of the coolest places that I went in that whole year. So welcome to the podcast because I want to talk about it. Carrie: (00:38) Thanks, Regina. And yeah, terrific. Actually, I think my memory goes back even further. I think we met in Pittsburgh at an ITS annual meeting. Regina: (00:46) Oh, we did meet in Pittsburgh. Yeah. Yeah. That’s when the concept of Mcity was just kind of getting underway. Carrie: (00:53) Yeah. We were just getting our legs under us. That’s right. Regina: (00:55) And here we are like Michigan and Pittsburgh now, two central hubs, right. For autonomous and connected vehicle. Regina: (01:02) So you’re now deputy director at Mcity. Tell us a little bit about, for most everybody in transportation knows Mcity. You guys have done such a great job of making sure people know who you are, but just in case there’s one person listening out there. Tell us a little bit about Mcity and what, what you do there. Carrie: (01:17) Yeah. So we, uh, are part of the University of Michigan and we’re a public-private consortium that works together to solve pre-competitive challenges for the deployment of cars that talk to each other and drive themselves. So what we found early on, uh, at the inception of Mcity, that there are a lot of challenges that go across verticals. So, um, you know, an automotive manufacturer may want to deploy an automated vehicle, however, they need to work with the infrastructure, they need to work with insurance companies. There’s a, there’s a myriad of problems that cut across various disciplines and sectors. So bringing together this diverse group of partners helps us to research those challenges. Carrie: (01:57) And an important part of what we do is also testing and deployment of the technology. So we have this purpose built test facility, the first of its kind called the Mcity test facility where we challenge these vehicles in all kinds of environments and all kinds of ways, uh, and then put them out on the streets of, of southeast Michigan, uh, to gain experience and their deployment. Regina: (02:20) So you guys really if, and if the public really can’t go, can I, cause I, this is, to me it’s like no, but if you haven’t had a chance to see it in your, in the industry, figure out how it is. You can see this because it is a city which allows you to drive through all these different road conditions and really learn how the car will adapt to someone running out in front of it. A dog, a child, whether it be, you know, snowing heavily. I remember that was one of the ones I remember most. The snowing. Carrie: (02:49) Yeah. Well, Michigan has snow, so that’s every search variable that we’re proud to have at our disposal. Regina: (02:55) So you guys have been at this now for what, four years? Carrie: (02:58) That’s right. Four years. Regina: (02:59) And how have you seen it grow from its initial sort of conceptual phases up through what you’re doing today? Carrie: (03:05) So initially there, there was a, there was a notion that there was a lot of work that we could do together. And now what we see is a, a vibrant research community with a diverse set of partners. We’re asking questions, not just about the technology but the legal liability and insurance implications of these technologies. We’ve even formed the first mobility journal at the University of Michigan. So imagine a law journal based exclusively on mobility, really exciting. But in the, in terms of the testing and the t, uh, deployments, we’ve continued to expand. Carrie: (03:39) We’ve updated our connected vehicle fleet to the latest standard. And, uh, within a couple of weeks here we’ll have over 2,500 connected vehicles driving around Ann Arbor to the current standards. Regina: (03:50) Really? Wow. And how, are they DSRC cause we’ll come to that. Carrie: (03:53) They have DSRC and uh, over 70 infrastructure sites that they’re communicating with. So, uh, that’s very exciting. Uh, we’ve also deployed our own driverless shuttles, not only inside our test facility but outside on campus. So that we can start to understand how do consumers interact with the technology. How does their trust change over time with exposure to the technology and how do other road users engage, uh, with the shuttles? And so I think from the beginning we thought that this deployment, there are these technologies, we’re a long way off. And what we’re finding is the questions that we were endeavoring to answer are all that more timely because the technology is coming faster in some ways than we had originally thought. Regina: (04:38) And is that because the manufacturers, the private industry is pushing them out faster or is that because the public wants them, they, that they’ve, that they’ve been, I guess adapting to this change and they want to see it faster? Carrie: (04:51) I think that there’s a general enthusiasm out there by a lot of people about these technologies, but we’re seeing a, unfortunately with recent accidents with the technology that actually public sentiment has pulled back somewhat. And that’s part of the reason that we believe so strongly in the work that we’re doing at Mcity, um, around testing. How can we provide transparent testing processes that can help to build trust with the users in this space? Regina: (05:18) So how’s it going out on the road with the connected vehicles? Because I think so connectivity, vehicle to vehicle, but also connectivity to infrastructure as well. How’s, how’s it going? Carrie: (05:28) So, uh, it’s, it’s going well. I think from, from the perspective of our own individual deployment, it’s, it’s been a big lift because we’re getting all of those final details and elements that you need for production environment in place, including a cybersecurity certificate management system, uh, to make sure that we can trust each other when we talk to each other. Uh, all of those kinds of elements in place. So it’s exciting to finally be at the top of that hill and now we can start measuring all of the success, um, in terms of vehicles, being able to communicate with each other and avoid collisions, communicating with the infrastructure as well so that we can not only be safer but more efficient. Um, right now those vehicles are operating, as you mentioned with DSRC. Uh, right now there’s a discussion whether that’s the technology that should prevail into the future or whether a new technology that’s very similar in a lot of ways. Carrie: (06:24) Um, Cellular V2X should actually prevail. And so we, it remains to be seen which one of those technologies will prevail or if we’ll see a combination of both. But it’s important that we continue to demonstrate in Ann Arbor and beyond deployment sites throughout the country. 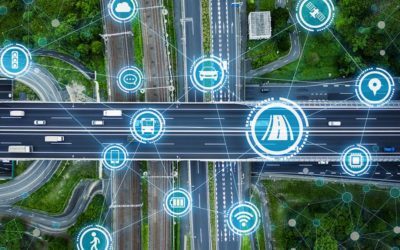 The importance of connected vehicle technology and improving safety and efficiency on our roadways. Regina: (06:47) So this is within the industry. I think very broadly, industry, has been one of the biggest debates DSRC versus 5G to put it bluntly,, and put it easily, you and I said on the same committee together, we were talking about this before the podcast and you hear very differing views and it’s kinda one of those few things in transportation that sort of as divided, right? I mean most of our issues are, they kind of meld together somehow. This one people are taking sides on. How do you see the technology that announcing one side or the other? You’re testing on DSRC. Are you guys always also deploying 5G out at Mcity? Carrie: (07:25) So we, we have deployed 5G at Mcity, uh, fixed 5G. So I think that right now there aren’t a lot of devices out there to test mobile versions of Cellular V2X, which is the subset of 5G that would allow a vehicle to vehicle communication for safety. But I think overall it is, it is challenging to sit in here, hear the discussions among the two technologies because I think overall they are actually on the same page what both, what both sides want is a safe environment for these vehicles to communicate, um, and save lives. And so I think that is the common thread and we just have to, you know, technologies evolve. 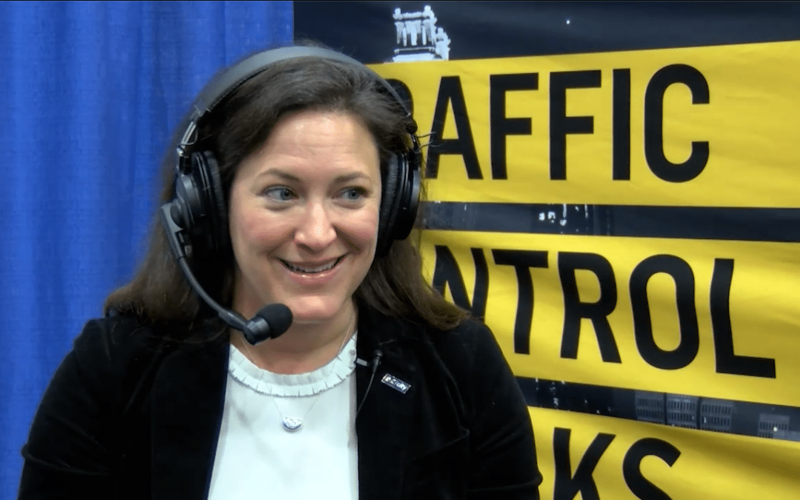 Carrie: (08:08) This is really natural and these, these discussions happen in many other sectors where technology is moving on and evolving and we just need to make sure that we don’t lose sight of, of, uh, moving forward for [inaudible] with vehicle connectivity for safety. And I think that’s, that’s what’s reassuring is that there’s so much passion to keep it going. Regina: (08:28) There’s a lot of passion and this is very, they’re very passionate. I guess the issue is, is right now DSRC was released, and I’m not trying to take a side, I’m just sort of saying, so DSRC really was set aside for the transportation industry to work in this connectivity cars, infrastructure, talking to one another. Those who believe 5G is better. Um, they have a lot of hoops they still have to go through. So DSRC is kind of a proven thing right now. Right, right. 5G is something that has to be proven, but it really has to be deployed. Carrie: (09:05) Right. And so I think there are companies that are working on that right now and in the next, I, I, if I had a crystal ball, I would predict in the next six months that we’re going to see more of those devices available so that others can explore the technology and, and how it works so that we can be in a similar place as we are with DSRC, at least in terms of the knowledge of how it operates. It forms. Regina: (09:29) Right. And then, and again, the safety equivalent, right? Regina: (09:32) So tell me, what do people tell you all? What does your research show that people are most concerned about when it comes to this new technology out on the roads? What is, I don’t want to necessarily use the word fear, but what are, what are their concerns? Carrie: (09:47) Sure. I think two things come up pretty, um, repeat in a, in a pretty reliably, first is safety, is this safe? Is it safe for me to put my child in an AV? Is it safe for me to walk across the street in front of an AV? You know, these are the kinds of things that we think by having small deployments out in the public, people can become accustomed to it. But one of the things that we learned from our deployment is that trust is a very important element of any deployment. And so we were very intentional when we deployed our shuttles to communicate with the community that was going to be receiving this technology. And I think that went a long way toward trust. The second issue that we hear about somewhat, maybe not quite as much, um, as, uh, regarding safety is privacy. Yeah. Privacy is something people are concerned about. Um, but I think we’ve probably given up quite a bit of our privacy without our phones that we can. Carrie: (10:50) So when people say to me, but the car will know everywhere I went and want to go and I’m thinking, so does your smartphone. Regina: (10:57) It’s already on, right? Yeah. They already know whoever they is. Yeah. Carrie: (11:00) Right, right. So I think we, we need to be mindful of these and wherever we can be transparent and proactive in, in terms of safety and privacy, we’ll see a much better consumer acceptance of these technologies. Because after all, a, we’re not talking about providing technology for technology’s sake. We know that we can improve safety on roadways, that these technologies can make more efficient use of the limited funding we have for our infrastructure. And we know that we can provide better accessibility for those who do not have good transportation options, whether it be from a financial perspective, uh, their geographic position or even their physical accessibility needs. Um, so moving forward with transparency will help, um, in trust and deployment. Regina: (11:46) So same question then on the public policy side. So those folks who work in DOTs, whether it’d be at the local level in cities or at the state level, what are you hearing there about their biggest concerns around the autonomous and connected rollout? Carrie: (11:59) Well, you know, these, you know, a number of municipalities have contacted us, especially in the wake of our shuttle deployment, and they feel a bit overwhelmed. They’re really interested in the technology, but they don’t know where to get the resources to even know where to start to educate themselves. And so I think having them connected with organizations like Naccho and ash, other organizations that can help them, um, to, to navigate this landscape landscape, which is, can be quite confusing if you’re not immersed in it everyday. Like you and I. Yeah, it is a lot. And, and of course, I guess as a public official, your primary duty is the public good. Regina: (12:38) Right. So, so if you were to say, based upon what you’ve now noticed over the last several years with Mcity, what is the public good of autonomous and connected? Carrie: (12:48) I think it’s those three points I mentioned earlier. It’s the safety, the efficiency and the accessibility. Um, the idea of changing someone’s life because they are able to safely get to work or get to a doctor’s appointment that they could not do before. Regina: (13:06) Yeah. So what’s your driving force for 2019? Carrie: (13:12) No, nothing like deploying a shuttle to realize where you aren’t accessible and uh, learning some of the challenges by putting it out in the real world. And again, making sure that these solutions solve real problems is really important. So how can we make sure that these technologies are accessible is going to be another important area for us this year. Regina: (13:35) You know, we’ve had a couple of conversations over the last two days here about the equities of transportation and it was interesting. Two different people raise the same one, which is for those workers who don’t work nine to five or eight to six or or whatever during, are – would, a traditional working day would be those workers who are working overnight there, their access to transportation is already so limited. Right. Um, they often don’t have the means in which to, you know, just call up an Uber or a Lyft and pay 20, 30 bucks to go one way or so. How much of that are you guys looking at what I call the equity? Carrie: (14:12) So it’s interesting. We, uh, we’re launching an online, uh, teach out discussion at the university where we actually have faculty members at the university, not Mcity specifically, uh, that are looking at just that faculty at the university that have worked on a, they call it, uh, uh, transportation insecurity index. Carrie: (14:33) Kind of like we have other similar insecurity indexes that are measured. Carrie: (14:39) Exactly. Because saying whether or not you have a car isn’t really a true measure of your, uh, mobility access. So I think I’m looking forward personally myself to seeing some of the results of that work, uh, coming forward. Regina: (14:53) Well, it sounds to me like that we’re just going to have to get you back. Carrie: (14:57) Well, I would love that Regina. Regina: (14:58) There are just too many things we still have to talk about, but, well, listen, thank you. Congratulations by the way on what you’re doing out there. It is a really phenomenal place. It’s you just, you broke it down in a way to where if you have any questions, it seems like there’s always something out there and in the city that’s looking at it. So congratulations and thanks for taking the time to be here. Carrie: (15:21) Oh, thanks so much. Regina was great to be with you today. Regina: (15:25) So as an addendum to this podcast, one of the things that Carrie and I spoke about was an announcement that they were going to make actually the next day, which is about what they call their ABC test for assessing the safety performance of automated vehicles. You’ll remember over the course of the last several months, there have been two very highly publicized fatalities around autonomous vehicles. And so what Mcity wanted to do was put forth a way in which there could be work around independent safety assessments, um, for autonomous vehicles. So it’s just one more way that Mcity is driving safety testing and safety protocols to make sure that all of the new intelligent transportation services that’s available really drive to that safety bottom line. So you can check that out at mcity.umich, which is u-m-i-c-h.edu. Check the show notes. We’ll have it there. Mcity.umich.edu and thanks to everybody at Mcity for the great work they’re doing. Regina: (16:33) So thanks so much for listening and participating in the POLICYSMART podcast. You can download the POLICYSMART app on the Apple App Store and Google Play, and you can listen to the podcast on Apple Podcast, Google Play, and now on Spotify. And also, please leave a review to help people like you, those interested in the next generation of mobility and intelligent transportation. Find us.